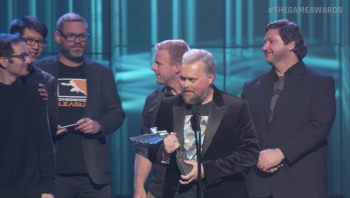 Overwatch won top honors at this year's The Game Awards. This year's The Game Awards had some really cool stuff, like a live action performance of the Doom soundtrack and some exclusive new gameplay footage, but it is, of course, an awards show, and every awards show has a winner. This year, Blizzard Entertainment's Overwatch took top honors, beating out Doom, Inside, Titanfall 2, and Uncharted 4. "While we've been very happy with how the game has been received, we're also extremely proud that this game and the world that we're building has a message and it's a message about heroism. It's a message about diversity. It's a message about a bright and positive and hopeful future. And these are all things that we really believe everyone needs a little bit of right now," said Blizzard's Ray Gresko.